EasiStripTM SUPRA One Step Ink Cleaner & Emulsion Remover is a liquid cleaner which provides a revolutionary, streamlined approach to cleaning and reclaiming textile printing screens. When used as directed this unique, inexpensive product dissolves plastisol and water base ink, water soluble screen blockout, direct emulsion and capillary film as well as tape adhesive residue. With EasiStrip SUPRA, textile screens can be cleaned for pennies by combining many of the cleaning processes into one. EasiStrip SUPRA is a zero VOC, low odor, non-flammable (NO flashpoint), biodegradable, non-hazardous product which will provide the benefits of less labor, less expense and improved efficiency to the screen cleaning and reclaiming operation. Let soak in tank until the emulsion/film loosens from screen, usually 2-4 minutes. 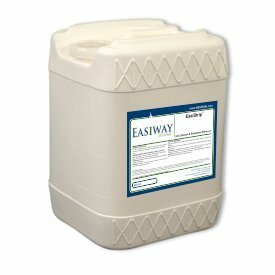 If you have any questions about this product by Easiway, contact us by completing and submitting the form below. If you are looking for a specif part number, please include it with your message.